The reality of death seems to be everywhere I turn. Some close friends in Georgia who are my age have recently lost their parents. It seems like each week when I go for a walk in the village, I hear about another family member who has died. And last weekend, one of my former volleyball players unexpectedly lost her mom. Her mom was an amazing woman who also worked with us at Westminster. Death is heartbreaking. It makes me so sad to see many people grieving. It is also a reminder that this life is so temporary. No one knows how long We have on earth. My scare with pre-cancer has helped me realize that. God's Word tells us that death comes because of sin, but we can have eternal life through faith in Jesus. This hope makes all the difference. I don't just have the days here on earth to live for myself. I know that I have eternity with God in heaven to look forward to. I also know that so many people around me live without that hope. So the question that comes to my mind is, "How am I going to use the days I have on this earth?" I want to spend my time here in ways that build God's kingdom. Sometimes I think that may be easier for me to keep that perspective as a "missionary." I live in Uganda, not because this is where I am most comfortable, but because God has work for us to do here. "For by grace you have been saved through faith. And this is not your own doing; it is the gift of God, not a result of works, so that no one should boast. For we are his workmanship, created in Christ Jesus for good works, which God prepared beforehand, that we should walk in them." Sometimes it is easier to remember that when you live in a foreign country. It is usually pretty easy for me here to remember that this world is not my home, and that we are on this earth because God still has work for us to do. In Phillipians 1:21, the Apostle Paul says that "to live is Christ and to die is gain(heaven)." The next verse talks about the "fruitful labor" that God has for us while we are on this earth. I praise God that He is showing me that the labor he has for us here is fruitful. 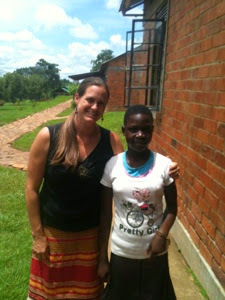 A few days agoI had the privilege of praying with a girl from GSF who wanted to be a part of God's family. She prayed that Jesus would be her Savior. Many missionaries and house moms have planted seeds and watered them in her life over the years. God graciously gave me the privilege of being there at the time He was bringing about the harvest in the life of this girl! Praise God! I am praying that even on days when I am feeling comfortable and at home in this life, that I will remember that God has a purpose for us in life beyond just being comfortable and happy. It is so easy to get lulled into thinking that life is primarily about my happiness. Elijah recently read the book, Percy Jackson, The Lightning Thief. In the book, the main character, Percy Jackson, is sent on a mission, but when he gets to a place where he is having a lot of fun, he loses track of time and starts forgetting about his mission. I think that is often a temptation for me, particularly in America. It is so easy to be entertained and distracted, forgetting our mission in this life. One of my goals in blogging is that my writing will help both me and those who read my blog to remember that God has a mission for all of us in this life. Some of us are called to be a part of what God is doing here in Uganda, and some are called to be a part of what God is doing in Watkinsville, Georgia. God is calling people to be a part of His kingdom work in all different places around the world. It is my prayer that wherever we find ourselves, we will remember that God has loved us, redeemed us, and adopted us. He has brought people into our lives and given us the privilege of showing His love to them and sharing His grace with them. It is my prayer that I will keep my eyes on Jesus, what He has done, and what He calls me to do, rather than getting distracted by focusing on the joys or sorrows of this life.